A conservation group says outdated system threatens the river by promising more water than it can supply to numerous users. 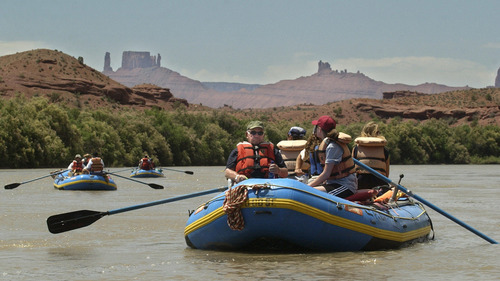 Al Hartmann | Tribune file photo American Rivers on Wednesday named the Colorado -- seen here above Moab -- America's most endangered river. Francisco Kjolseth | The Salt Lake Tribune Dead, browned tamarisk lines the banks of the Colorado River as efforts to eliminate the invasive species appear to be working. The small tamarisk leaf beetle, imported from China, is used to control the non-native and invasive tamarisk plant. Tamarisk was brought to North America as an ornamental plant and has displaced native vegetation along rivers in the West. The beetle was released in 2004 along the Colorado River in Grand County, upstream of Canyonlands National Park in an effort to knock back tamarisk. Paul Fraughton | Tribune file photo A new study released Wednesday named the Colorado River -- seen here flowing out of Glen Canyon Dam -- as America's most endangered river. Trent Nelson | Tribune file photo A view from Hite Overlook at Lake Powell, showing low water levels in 2003 as the Colorado River runs through large deposits of sediment. 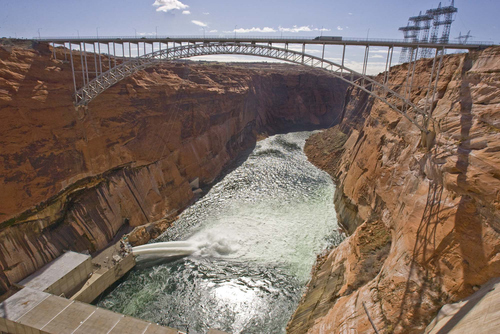 Along its 1,450-mile journey through Utah and several other Western states, the Colorado River&apos;s flow is blocked by more than 100 dams that generate power and supply water to nearly 36 million. These obstructions and withdrawals have played a key role in the economic development of an arid corner of the nation, but they come with environmental and economic costs that are only now coming into focus. In a report released Wednesday, the conservation group American Rivers named the Colorado the nation&apos;s most endangered river, facing threats from an outdated water-management system that has promised more water to an abundance of users than it can deliver. "We&apos;re at a critical point with the supply-and-demand imbalance. Climate change and population growth are expected to exacerbate that," said Matt Niemerski, director of Western water policy at American Rivers. "There is no silver bullet here. If we don&apos;t improve management the system will break." A new study out of Columbia University predicts warming temperatures will reduce the Colorado&apos;s flow by 10 percent over the next few decades, while an Interior Department study of the Colorado River Basin predicts shortfalls in the river&apos;s ability to deliver water currently allocated. "There are 10 rivers on this list [of endangered rivers]. None are remotely close to the importance of the Colorado. Every major city in the Southwest depends on it, even those outside the basin. The ranking is highly deserved," said Brad Udall, a hydrologist and water policy expert at the University of Colorado. "You have an enormous impending collision between 19th century water law, 20th century infrastructure and 21st century population growth and climate change. To resolve this we will need to think long and hard about solutions, none of which have to do with supply and everything to do with savvy management." Fed by several major tributaries, such as the Green and San Juan, the Colorado originates under the continental divide in Rocky Mountain National Park. It hits the first diversion 20 miles from its source, then stairsteps behind a series of massive dams, forming Lake Granby, Williams Fork Reservoir, Lake Powell, Lake Mead, Lake Mojave, Lake Havasu and ending at Morelos Dam on the Mexican border. Five trillion gallons a year are siphoned away, ensuring the river entering Mexico is nothing more than a ghost, according to Gary Wockner, director of Save the Colorado. Yet several projects seek to pull out even more water. 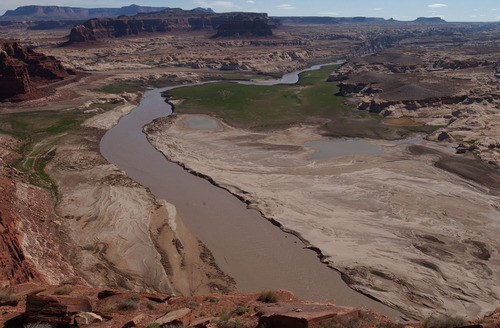 "Utah is the apex of river-destruction projects on the Colorado," Wockner said, pointing to the proposed Lake Powell pipeline and Green River nuclear power plant. "Utah is proposing several pork-barrel water projects … to prevent other states and ecosystems from using this water. It&apos;s childish, destructive and a waste of money," added Zach Frankel, executive director of Utah Rivers Council. "Utah is America&apos;s most wasteful water user and now this waste is impacting the other 35 million people in the basin." The river irrigates 4 million acres that grow 15 percent of the nation&apos;s crops, but also supports a $26 billion recreation economy, according to the American Rivers report. The U.S. Bureau of Reclamation, the agency that built some of the river&apos;s major diversions, praised the report for drawing attention to the collaborative efforts underway to address the Colorado&apos;s problems. "The study is a critical first step in the basin to establish a common technical foundation from which important discussions can begin regarding possible strategies to reduce future supply-and-demand imbalances," said Anne Castle, the Department of Interior&apos;s assistant secretary for water and science. She singled out a recent supplement to the 1944 water treaty with Mexico that is expected to allow the Colorado to flow into the Gulf of California for the first time in decades. 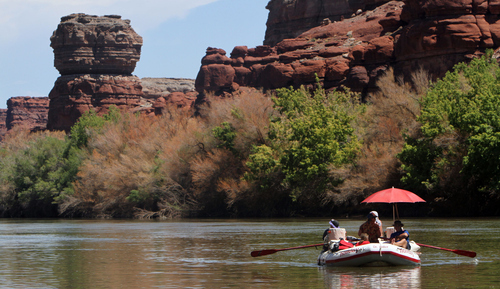 The report urged Congress to follow up Interior&apos;s Colorado River Basin study with "bold action" and funding for water-saving technologies and new water-sharing mechanisms. It highlighted Reclamation&apos;s WaterSMART and Title XVI programs, which help return reclaimed water to the river and allow for more effective use of existing diversions and pipelines. But sacrifices will likely be needed to keep demand in line with supply. "We can&apos;t keep taking more water out of the river," Wockner said. "The low-hanging fruit is water conservation. There are enormous savings in all the cities across the basin if we just start adapting our landscapes to low-water and natural systems. About half the water that comes out of the river that is used by cities is for growing grass and suburban lawns."